Build up your arm strength and beautify your local community in a single stroke by dropping homemade seed bombs in and around your neighborhood. A guerrilla gardening technique anyone can participate in, seed bombing is a fun and effective way to add tiny oases of wildflowers and healthy green plants in vacant lots and other overlooked and neglected parcels of land. Seed bomb assemblage is quite simple. After soaking your seeds overnight, mix together five parts clay with one part compost and one part seeds. Make sure the seeds are native to the area, as you do not want your seedlings to upset your local ecosystem. Knead together with a little water and then roll up the mixture into individual balls that fit within the palm of your hand. Allow for the balls to dry overnight. 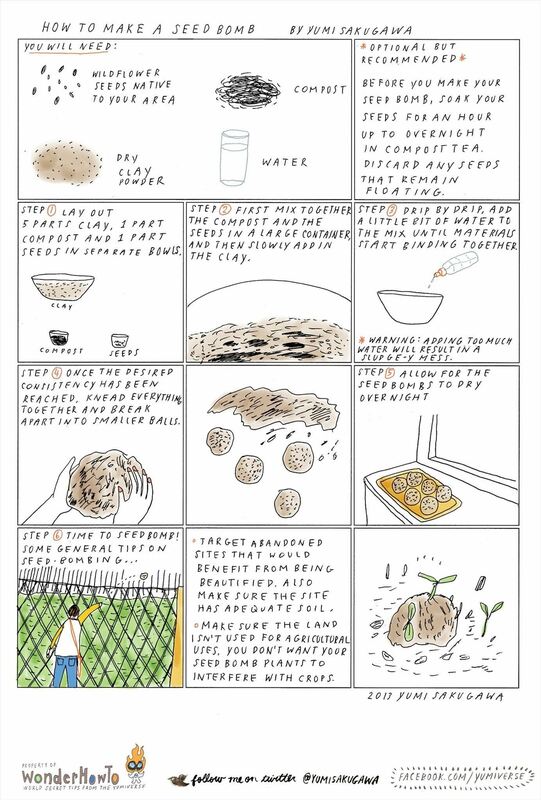 The following day, throw your seed bombs into vacant lots, abandoned parcels of land, and anywhere with sufficient soil, moisture and sunlight that will coax your seed bomb into growing plants. Got your own tips and techniques for making a seed bomb? Share with us. Isn't step Five a contradiction? Sorry, bad wording! You can either let it dry overnight or let it sit for a while on a sunny windowsill. Basically, once it's pretty dry and not moist it's ready for seed-bombing. where do I get the clay powder? Your best bet is probably to check out your local pottery / ceramic businesses. You can also order online from a website called Echo Ceramics.